Even though monks on the Island of Reichenau composed texts about the Bodensee in the ninth century, a literary scene was not established until the 20th century. A reason for this could be that it was not until the 20th century that there was an increasing settlement of prominent artists and writers on the Bodensee, and with that the numerous publications and connections, which have shaped the literary landscape of the Bodensee until today. Outstanding in this context is the Bodenseejahrbuch, a transborder annual, published from 1914 to 1965, which reflected the cultural diversity around the lake with articles from Hermann Hesse, Otto Dix and Emanuel von Bodman among others. From the 1950s on, a panel of communication was established with the Bodensee-Klub, which, besides organizing literary or art events, co-initialized popular literary-awards including the “Meersburger Drostepreis” or the “Bodensee-Literaturpreis”. This “Bodensee-Literaturpreis,” founded by the city of Überlingen, is awarded every two years by a jury composed of members from the three bordering countries. 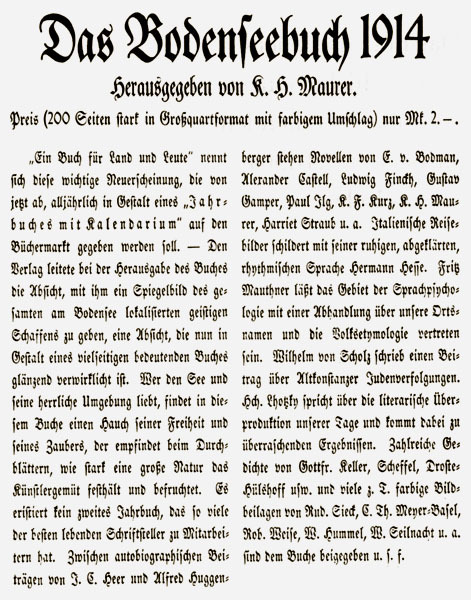 Although for these awards, as a nomination prerequisite, a reference to the Bodensee is required in the literary works–the so-called “Bodanität” – the Werkstattgespräche of the “Meersburger Autorenrunde” (Meersburg literary circle), co-founded by Martin Walser, do not insist on such prerequisites. Despite this, “space,” “language” and the connected “identity” characterize Bodensee literature: while the early writers described the idyll and the paradisiac landscapes, today many deal with the local German dialect, the unifying Alemannic (alemannisch), as well as with the real living conditions, society and the environment on the lake – for example painter and poet Bruno Epple. 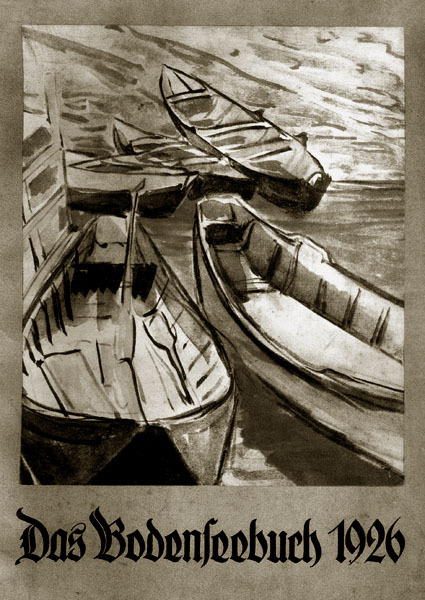 Numerous institutions, cultural organizations and the publishing media make a vivid literary connection possible between the countries, in which the writings are not bound to specific locations but rather float around the lake to the other side and are washed ashore–and yet remain “shoreless”.